This post is filed under Cheese, Fast Food, Pepperoni, Peppers, Pizza, Pizza Hut, Red Onions, Sausage, Tomato Sauce. 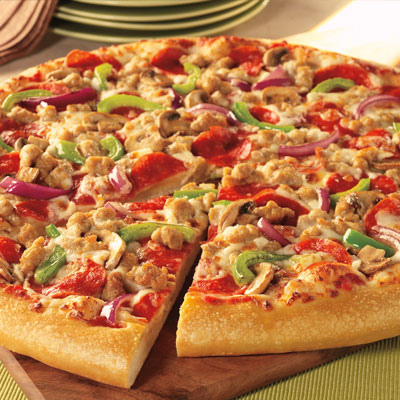 Pizza hut pizza taste extremely good as long as you don’t get the pizza mia (aka pizza flavor missing in action). 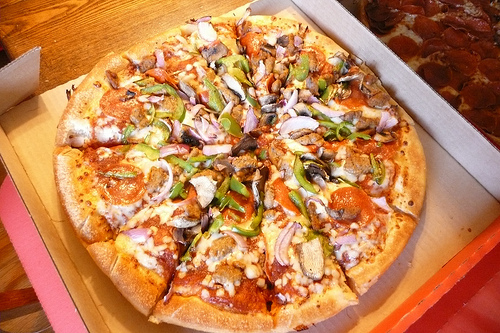 The normal pizza hut pizza has the extremely good crust, quality sauce and cheese but the pizza mia uses a crust similar to that of a cheap frozen pizza, it is also hard in some cases and also dry. Sadly I am only able to get a good pizza hut pizza once in a while other than that it is costco pizza (extremely good also but the crust cane compete with that of pizza huts), pizza hut = a lot of money for a little bit of food. What I would give for a pizza with too many peppers. . . I used to love Pizza Hut pizza and wouldn’t but anything else, but over the past 5 years the taste has gotten worse and the toppings have become far less generous. I used to support Pizza Hut only, but now I don’t. =( Too many bed pizza deliveries, mostly cold and tasteless pizzas (I prefer the thin crust).